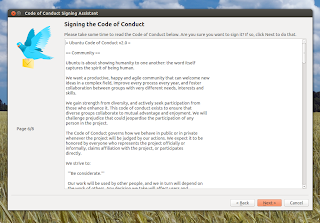 Signing the Ubuntu Code of Conduct may seem difficult, especially for relatively new Linux users so to make things easier, Marten de Vries has created an application called Code of Conduct Signing Assistant which should make make it easier to sign the Ubuntu Code of Conduct. You need to sign the Ubuntu Code of Conduct if you want to contribute to various Launchpad projects, upload packages to a Launchpad PPA and so on. The first Code of Conduct Signing Assistant public version was released recently, so there might be some rough edges, but overall, the application serves its purpose and it's quite easy to use, especially compared to the manual instructions of signing the Ubuntu CoC. - On the second page of the Code of Conduct Signing Assistant, you'll have to select a PGP key or create a new one. It's probably better to create the key via command line before starting the Code of Conduct Assistant since you have more options which aren't available if you'll use the Code of Conduct Assistant and furthermore, once you create the key using the GUI, it may seem it didn't work because the application doesn't let the user know he must perform some actions to generate the key (for instance, creating the PGP key from the command line, you'll see a message like the following: "We need to generate a lot of random bytes. It is a good idea to perform some other action (type on the keyboard, move the mouse, utilize the disks) during the prime generation; this gives the random number generator a better chance to gain enough entropy"). - When you reach "page 7" (screenshot above), you'll have to download the Ubuntu Code of Conduct to your computer, however, the download link doesn't work in the Code of Conduct Signing Assistant window, or at least it didn't work for me so if that's the case for you too, right click the download link, select "Copy link" and copy it to a web browser so you can download the file. That's pretty much it, the Code of Conduct Signing Assistant should take care of everything you need to sign the Ubuntu Code of Conduct. 1. Ubuntu 12.10 and 12.04 users will firstly need to install "python3-gnupg" from a PPA to be able to install this application, because that package isn't available in the Ubuntu repositories. You can download python3-gnupg deb from HERE (click the arrow next to the package name, then scroll down and click "python3-gnupg*.deb" (I've replaced the version in the filename with "*"), then install it. I didn't link directly to the deb file because if a newer version is uploaded, the link will stop working. Once installed, launch Code of Conduct Signing Assistant from the Dash / menu and follow the instructions. If you don't want to add the PPA, you can download the Code of Conduct Signing Assistant deb or source code via Launchpad.